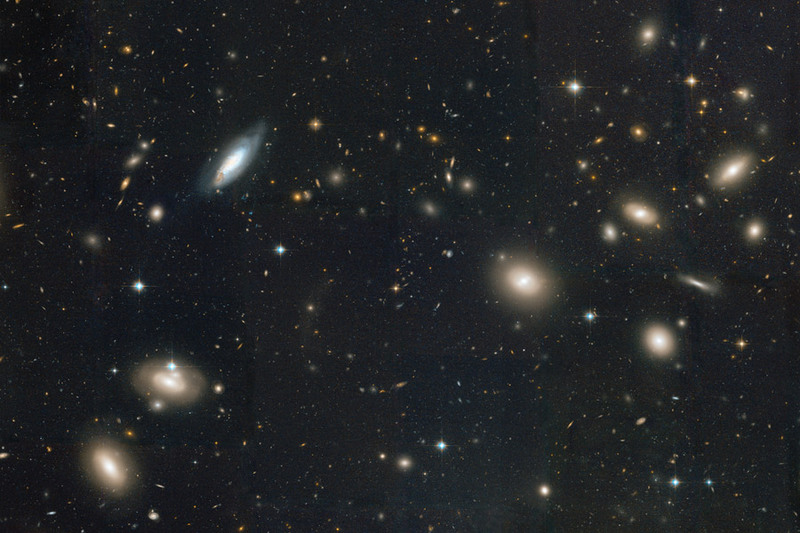 Image of the Coma Cluster taken by Hubble. Credit: NASA, ESA, Hubble Heritage (STScI/AURA). Per NASA rules, image in public domain. In the latest entry in my Physics for Non-Physicists series, I will go over some of the evidence for dark matter from measurements of galactic clusters. This post is more of a historical overview of the subject than a review of the most recent literature. I gave a very brief introduction to dark matter in my previous post on the thermal history of the universe. To recap, dark matter is a form of matter believed to exist that does not interact much with either itself or with the particles of the Standard Model. As far back as the 1930s (and possibly earlier), the theoretical background and experimental methods of astrophysics had advanced to the point where things like the velocities and luminosities of far-away galaxies could be measured with a reasonable amount of accuracy. Galactic clusters are a structure containing many galaxies and associated gas in a gravitationally-bound system. In cases where the effects of general relativity can be ignored with little effect (i.e. most cases), gravity follows a Kepler potential: the gravitational potential energy is proportional to inverse distance while the gravitational force is proportional to the square of the inverse distance. For a Kepler potential, it can be shown that the center-of-mass (removing any overall motion) kinetic energy (T, calculated from taking the sum of the kinetic energies of all objects in the cluster) has a particular relationship to the internal gravitational potential energy (U): 2T = -U. This is known as the virial theorem. In the early 1930s, an astronomer named Fritz Zwicky was studying the properties of the Coma Cluster (shown at the top of this post). Using the above results, he compared the mass as estimated from the virial theorem to the mass as estimated from the luminosity. The result was surprising: What I’ll call the “virial mass” was much larger than the “luminosity mass:” the galaxies in the cluster seemed to be moving much too fast. Zwicky’s 1937 paper in Ap.J. can be found here. An earlier paper was published in 1933, but it’s not in English so I cannot read it.